O’Brien Criminal and Civil Solicitors advises and represents people who have been mistreated by those in positions of authority. Our lawyers are often approached by clients who are hesitant to make civil claims against the police because they feel that they do not have a case that is likely to succeed. We have developed a set of frequently asked questions to help you gain a better understanding of when a potential civil claim against the police might arise. The best course of action is to call us and to book a free first consultation. This provides you with an opportunity to speak to an experienced civil solicitor who can advise you on the prospects of your case. I have pending criminal charges against me, can I sue the police? Yes, though it sometimes helps to finalise your existing criminal matter(s) before you commence a civil claim against the police. That being said, we are a full service criminal defence firm which means that we can represent you in your criminal matter(s), and then proceed to assist you in your civil claim against the police. I haven’t been charged, is it possible to make a claim? Yes. You do not need to be charged to make a claim against the police for assault, police brutality, wrongful arrest and false imprisonment. I have been found/plead guilty to an offence, can I sue the police? Yes. You can make a civil claim against the police in situations where you were falsely arrested before being charged, the police used excessive force to arrest you, and/or where your detention was unlawful. I can’t afford a lawyer, how can I take civil action against the police? Speak to us about your matter. If we think you might have a successful claim, we can help you sue the police on a ‘no win, no fee basis’. Why choose O’Brien Criminal & Civil Solicitors? 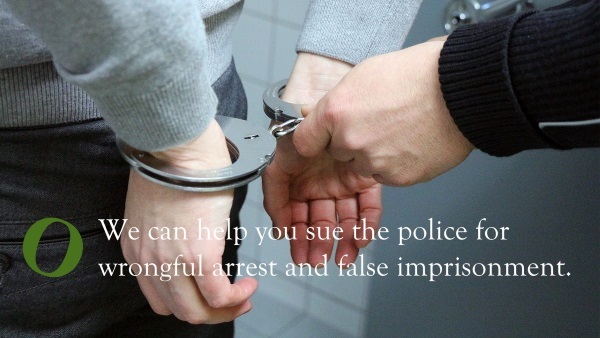 We are experienced wrongful arrest and false imprisonment lawyers who can help you sue the police for their unlawful conduct. Our senior civil solicitor, Deo Indevar, has broad experience in several jurisdictions, having practised and litigated matters across Australia. He can represent you in your case, no matter your location. We boast a civil litigation success rate that is second to none. Our exceptionally high win rate can be explained by our expertise as unlawful arrest and false imprisonment lawyers. Read our list of case studies where we have successfully helped clients sue the police for assault, unlawful arrest and false imprisonment. If you are a victim of police brutality, do not hesitate to speak to us. You deserve to assert your rights and to seek compensation if you have been unfairly treated. Contact us on (02) 9261 4281 to book a free first consultation with one of our civil solicitors. Alternatively, drop as a message through our online contact form and we’ll get back to you as soon as possible. We are experienced wrongful arrest and false imprisonment lawyers.